Two years ago I started a YouTube channel, SandersteadCCTV, simply as a way to show our players the filmed highlights from a couple of games featuring the Surrey cricket club I have played for for over 30 years. Somehow, by late 2017, views for the channel hit 20,000 and it was clear that people from outside the club were finding the films and watching them. We were clearly onto something so, during the 2018 season, I filmed as many of our 1st XI matches (and some Sunday friendlies) as I could – my son is a player so I would have been watching anyway. Over the summer the channel simply exploded beyond any expectations – and who knows where it could go to from here. All the above has been delivered with zero marketing activity, and zero cost – just the power of good content and characters. Zoella I am not, but these are mind-blowing numbers for a small grass roots cricket club in Surrey that no-one has ever heard of! Indeed, a typical 1st XI league game will be watched at the ground by the the proverbial “one man and his dog”, yet the filmed highlights of the same match on YouTube will be seen by more people than can fit into The Oval (typical views are 30k per match, and growing). In addition to views, we get overwhelmingly positive engagement from our loyal and rapidly growing fan-base. Many people want to know more about the players, the characters, and our beautiful ground, and they actively follow the team’s progress through the season. Some of our players are even being recognised in the street! A hugely rewarding by-product is when people comment that our channel inspires them to start playing the game again after retiring too early, or having not played since school, or even to give it a go for the first time. We have regular requests from other teams to play against us, and many young players ask if they can join the club. We have “overseas” cricketers from cricketing countries like Australia, India, Pakistan, and South Africa ask if they can play for us during our summer (their winter). We even had a lady from Manchester contact us to ask if we could let her two sons play for Sanderstead in a friendly game as a Christmas present! And next summer we have a group of English cricket-starved fans living in Poland coming to watch us play live – seems there’s not much leather on willow action available in Krakow! Why has this all happened, you might ask (I do, frequently)? 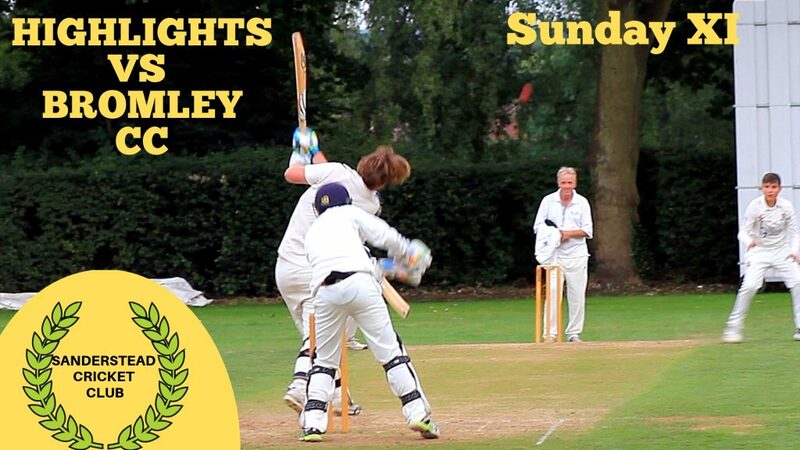 I put it down to a mixture of quality club cricket, a talented young team, and a sprinkling of interesting characters (on and off the field), all packaged up into 20-30 minute match highlights with a slightly idiosyncratic commentary (modesty forbids me to elaborate). Professional cricket, so brilliantly covered by the likes of Sky Sports, clearly provides amazing entertainment at the highest level, but what we provide at SandersteadCCTV is more accessible for most cricket fans – it is the sort of cricket our viewers might imagine themselves playing in, and as such has a different appeal. It is highly relatable, and that is why people watch, and keep coming back. Having created a thriving channel, and incredibly loyal fan-base, I am now figuring out what we can do with it as we grow. As ex-COO of FremantleMedia Enterprises, I know a bit about commercialising media properties, so why not apply this to SandersteadCCTV? Like most small cricket clubs, finances at Sanderstead are always a struggle and we manage year by year through a combination of member subscriptions, donations, fund-raising events and bar takings! By monetising the channel we can create a game-changing new model for financing local cricket (and other sports) clubs – this presents a win-win for the clubs, for local communities, and for governing sports bodies seeking to increase grass roots interest. Right now, the channel generates a small amount of advertising from YouTube, enough for a few after-match beers for now, but who knows what this could grow to as our audience builds. The aim for 2019 is to at least double 2018’s subscribers, views, watch time and advertising. Sponsorship is a bigger opportunity, and we are looking to work with a small number of businesses who share our community-building aims and can see the benefit of an association with a grass roots cricket club with a growing, and engaged, global audience. Then there is the potential for transactional income streams, such as a merchandise range for our fans, 70% of whom are below 34 yrs old. Our players can benefit too. Not only can they see themselves play and improve their game, but also as they become YouTube personalities they can drive revenue streams of their own, for example by creating online coaching videos, or featuring in “unpacking the kit bag” videos showing what kit they use and adding affiliate links for people to buy what they like, with a commission going to the player. YouTube and other social media makes such possibilities extremely easy to pursue. We are also planning to create volunteering or work opportunities across the club which our younger players can incorporate into their Duke of Edinburgh Award process, or even just to learn some new skills. Examples include pitch and ground preparation, bar work, social media management, YouTube filming and channel management, even getting involved in our merchandise operation (launching by the start of the 2019 season). It is an exciting opportunity, not just for Sanderstead, but for all grass roots cricket clubs, and if we can inspire others to create their own channels, becoming more financially self-sufficient in the process, then everybody benefits. The 2019 season is nearly upon us, and planning is well underway to make it a really good one – for the club and our fans! Anyone with ideas, suggestions, or an interest in what we do, please get in touch.